Two cousins who both in the music business received honours together at Bangor University graduation ceremonies this year (11-17 July 2015). Rock musician and Super Furry Animals member, Gruff Rhys from Bethesda, Gwynedd, and Radio 1 DJ Huw Stephens both received Honorary Fellowships at Bangor University. They were among a number of talented individuals, who have connections with the University or with Wales, who received Honorary Fellowships during the University’s annual graduation ceremonies. Lowri Evans.Gruff Rhys fitted the Bangor University degree ceremony between playing at festivals, from Glastonbury to Japan, with the Super Furry Animals. He has recently completed a successful tour with the Super Furry Animals. In the last few years, he has been working on a number of solo projects over the past few years including most recently, writing the film score for Set fire to the Stars, a film about the last days of Dylan Thomas, and American Interior a tour, film, mobile app and book in which Gruff Rhys goes on a personal journey to follow the footsteps of Welshman John Evans, who explored and mapped the Missouri river while searching of a mythical tribe of Welsh-speaking Indians. American Interior was recently shortlisted for the English non-fiction Welsh Book of the year Awards, while his solo album Hotel Shampoo won the 2011 Welsh Music Prize. His electro-pop collaboration, Neon Neon were nominated for a Nationwide Mercury Prize for the Stainless Style album in 2008. Cousin, Huw Stephens was also honoured for his contribution to contemporary music before heading off to contribute to Latitude Festival. He is BBC Radio 1’s youngest ever DJ and has also co-hosted BBC Radio Cymru's music strand, C2. Huw Stephens also broadcasts and writes about music as well as curating and introducing the performances at several music festivals. In 2007 he established a new musical festival in Cardiff Sŵn. The Honorary Fellowships are awarded to recognise outstanding contribution in an individual’s particular field. They are presented during a number of the University’s Degree ceremonies. Jeremy Howell.A native of ‘Pen Llŷn’ who attended Ysgol Glan y Môr, Pwllheli, it might be no surprise that Lowri Evans has made her mark in maritime affairs. Lowri Evans, has been Director General of the Directorate-General for Maritime Affairs and Fisheries for the European Commission, for the last five years. 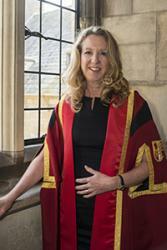 Lowri Evans received an Honorary Fellowship for her contribution to Marine Science. Bangor graduate, Jeremy Howell, a professor at the University of San Francisco, a small, exclusive Jesuit university received an Honorary Fellowship for his services to Sports Science. 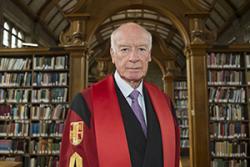 Former Bangor University Registrar, Dr David Roberts received an Honorary Fellowship in recognition of his services to the University. Recently retired former, former Registrar and Secretary, Dr David Roberts was a member of staff for 35 years, 11 of which were as Academic Registrar prior to becoming the University Registrar, a post he held for 15 years. 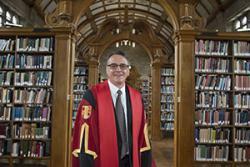 Dr Roberts recently authored the latest history of the University, Bangor University 1884-2009. 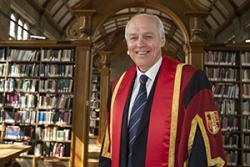 Dr David Roberts.Joining him in that Ceremony was Bernard Taylor CBE, who graduated from Bangor University in 1958. Currently Chairman of Cambridge Laboratories Ltd. Mr Taylor has a degree in Zoology from Bangor University and began his pharmaceutical career in marketing with SmithKline & French. He was with Glaxo from 1963 - 1990, mainly in Australasia, becoming Chief Executive of Glaxo Worldwide. He subsequently co-founded and became Executive Chairman of Medeva plc, before moving to his current position. He is to be rewarded for his services to pharmaceutical science. 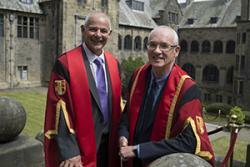 Myrddin ap Dafydd and Meirion Prys Jones received Fellowships at the same ceremony. Founder of Gwasg Carreg Gwalch, a press and publishing house in Llanrwst, Myrddin ap Dafydd was honoured for his services to Welsh Literature and to the publishing industry in Wales. 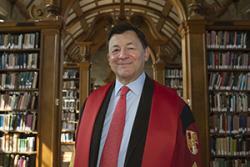 Joining him is Meirion Prys Jones, chair of the Network to Promote Linguistic Diversity. He is a former chief executive of the Welsh Language Board and is well-known and respected across Europe by people involved in linguistic rights and language planning. It is for work in this area that he receives the Fellowship. Bernard Taylor CBENicholas Snowman OBE, Chairman of Wartski’s visited the Universty to receive an Honorary Fellowship for his services to business. People will be more familiar with the Wartski name, that with that of Nicholas Snowman, though he is the fourth gene ration member of the Wartski family to lead the firm,originally founded in Bangor by Morris Wartski in 1865, a refugee from the Tsarist Russia, the now a famed London-based jewellers Wartski of Llandudno, in now one of the world’s most respected and eminent jewellers. The company are art and antique dealers specializing in fine jewellery, gold boxes, silver and works of art by Carl Fabergé. Mr Snowman receives the fellowship. He was joined in the Ceremony by Bangor graduate Shireen Chambers, who is currently the Executive and Technical Director of Institute of Chartered Foresters. 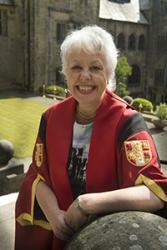 Shireen Chambers received her Honorary Fellowship for her services to Forestry. Stories about the achievements and successes of our graduates can be found here.